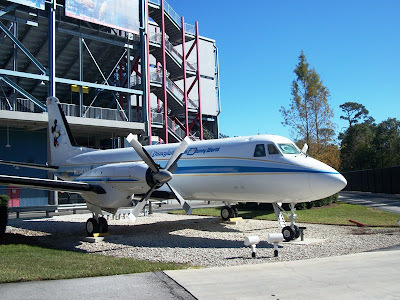 This plane, found along the winding road of the Studio Backlot Tour is a wonder to behold. The tail number of N234MM would originally be called by the proper designation of “two three four metro metro,” but soon the FAA replaced the “metro metro” with “Mickey Mouse,” and so it was known for the remainder of its life. The Grumman G-159 Gulfstream I twin-turbo-prop plane may not look like much, but it has plenty of stories to tell. The plane, which began its life in 1963, was not the first plane owned by Disney, but it was the plane that Walt Disney used to locate the land that would become Walt Disney World. In fact, after flying over the expanse of land near I-4, the plane was on a refueling stop in New Orleans on November 22, 1963 when Walt Disney learned that John F. Kennedy had been assassinated. It was on this same flight, from New Orleans back to California, that Walt decided that Central Florida would be the home of his Disney World. In 1992, after years of shuttling Disney executives to and fro, N234MM was retired. It was decided that the plane’s final resting place would be where any and all Disney enthusiasts could observe it, Disney-MGM Studios. That October, the plane landed for a final time in Florida, along World Drive. After landing, it was lifted by a crane and towed to a resting spot along the Studios’ Backlot, near the Facilities Maintenance building. It was gutted and sealed, assuring that it would no longer take to the air, and remained in this location for a number of years before being moved to its current location, behind Lights, Motors, Action!, during an overhaul of a majority of the Backlot.